Montmorency tart cherries are the most common variety of tart cherries grown in the U.S.—primarily in Michigan—and are available year-round in dried, frozen, canned, juice and juice concentrate forms. The ruby-red color and distinctive sour-sweet taste is due to the concentration of polyphenols, specifically anthocyanins. Other varieties of tart cherries may be imported and not grown locally, says the Cherry Marketing Institute, a nonprofit organization funded by U.S. tart cherry growers and processors. The institute, based in Dewitt, Michigan, funded the study but had no role in the study design, data collection or analysis, or preparation or decision to publish the manuscript. In this randomized-controlled clinical trial, 34 men and women between the ages of 65-80 years drank either 8 oz. of Montmorency tart cherry juice or a control beverage twice a day for 12 weeks. At the end of the 12 weeks, participants in the tart cherry group had lower systolic blood pressure and LDL cholesterol, as well as lower levels of certain substances in the blood that indicate inflammation and oxidative stress, including the biomarkers of c-reactive protein (CRP) and malondialdehyde (MDA), compared to the control group. 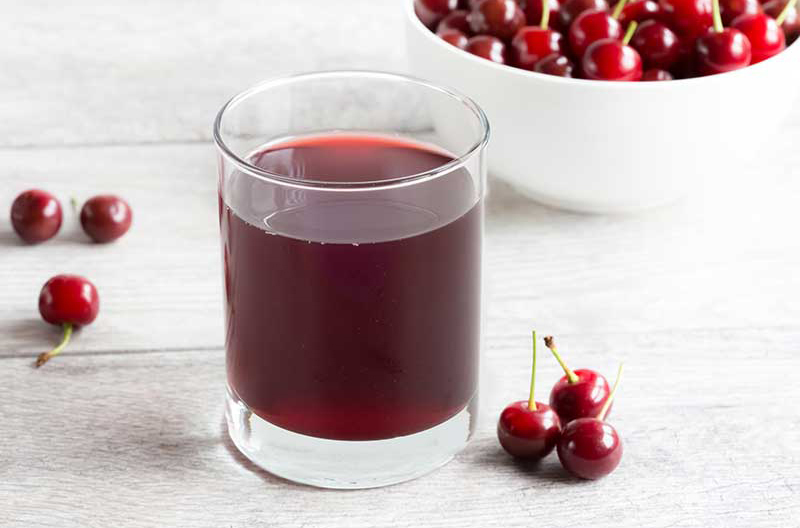 The participants who drank the 100 percent tart cherry juice also exhibited increased DNA repair activity of OGG1, or 8-oxoguanine glycosylase. Compared to the levels at baseline, the participants drinking tart cherry juice lowered oxidized low-density lipoprotein by 11 percent, CRP levels by 25 percent and MDA levels by 3 percent. Baseline levels of additional biomarkers of inflammation and oxidative stress were not statistically different between the tart cherry and control groups. The participants consumed 16 oz. of Montmorency tart cherry juice daily, which contain 181 calories and 34 grams of sugar—lower than other commonly consumed fruit juices and soft drinks—but the juice did not change participants’ body weight, insulin levels, or insulin resistance. This suggests that Montmorency tart cherry juice can be incorporated into the diet without increasing calorie or sugar intake, especially if consumed in place of sugar-sweetened beverages.